Remember those delicious bran muffins I mentioned last week? I thought I’d share the recipe for anyone interested. I’ve been trying to eat healthy these past few months, but had really started craving something sweet and chocolat-ey. 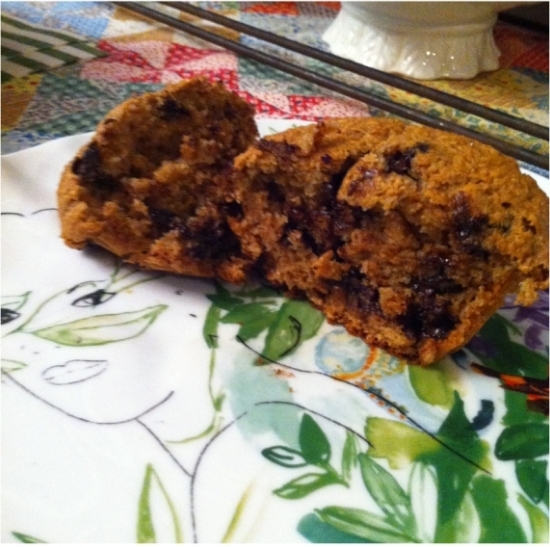 Instead of baking cookies or something, I tried a basic bran muffin recipe, but added dark chocolate chips. 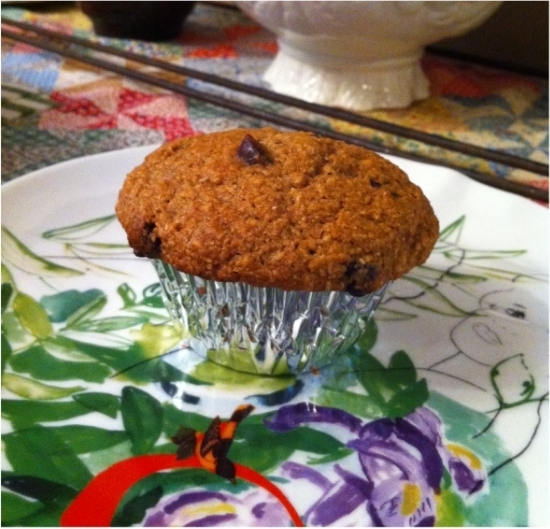 I substituted honey for sugar and applesauce for butter, so these are actually even healthier than regular bran muffins. Plus, the husband loves them! I made these a second time last week and threw in a handful of blueberries and 2 mushed up bananas. It definitely made them more moist and flavorful, but I’m thinking that I won’t add blueberries again – I prefer to just eat them raw..
don’t you love that anthro plate that I picked up on clearance here in Tulsa? Anyway, I won’t lie and say that these are the tastiest sweet treat, but they did satisfy my craving. If you don’t mind extra wheaty/branny flavor, you might like them. I was pretty convinced that the husband would find them disgusting, but he actually seemed pretty impressed with them, especially the second time around. Various amounts dark chocolate chips, nuts, raisins, blueberries or whatever add-ins you want. I put about 1/3 cups dark chocolate and 1/2 cup of blueberries. I also added 2 mushed up bananas, and that time used just a little less applesauce. Preheat oven to 400. Mix flour, bran, baking soda, and baking powder. In separate bowl, mix milk, eggs, butter/oil, and honey. Combine the wet and dry ingredients and then stir in your add ins. Spoon into lightly oiled muffin tins or foil muffin cups and bake for about 18 minutes. I noticed that they took about 3-4 minutes longer when I used banana in the recipe, so just check them until they are firm. Makes 12 muffins. And now to go tidy the kitchen for a lil photoshoot happening in about an hour. And this time it’s not me! The husband is doing a story about home-brewing for Tulsa People Magazine. I’ll post a scan of the article when it’s out. Omg these look so wonderful! I am not really into cooking (my poor, poor family), but I do like to bake so I’ll have to try your recipe! Excited to see the spread, my husband ruined my stove top brewing his own beer last year, but it was delicious! Thanks for sharing such a wonderful receipe wid me…..